Mill Spring, N.C. – In a week that exuded many historic moments for U.S. equestrian teams, combined driving added another. 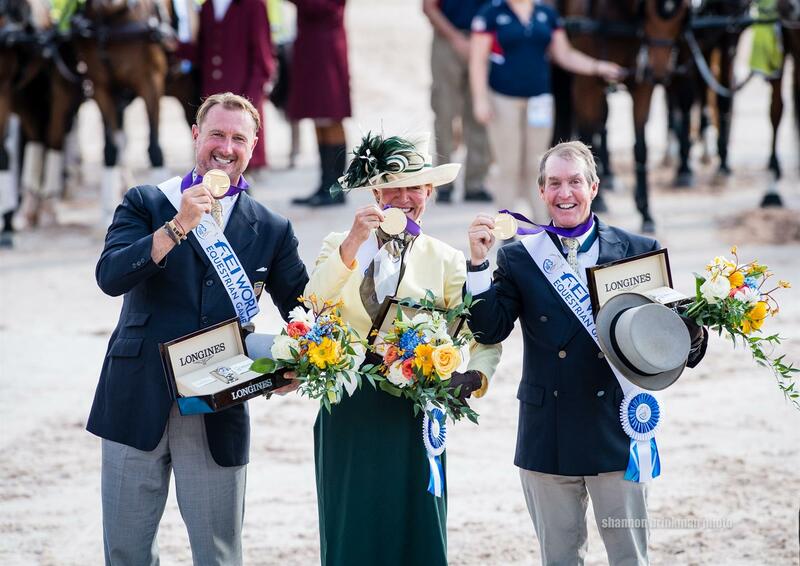 They closed out their home FEI World Equestrian Games (WEG) with their first-ever four-in-hand team gold medal at Tryon 2018 on Sunday. The U.S. Driving Team of James “Jimmy” Fairclough, Misdee Wrigley Miller, Chester Weber, and their respective groups of horses ended with 353.39 penalties, following three phases of competition. In addition, Weber earned his second career individual WEG silver medal, ending on 163.38 penalties. The Netherlands won silver on 356.79 penalties and Belgium won bronze with 364.089 penalties. Individually, Australia’s Boyd Exell won gold with 154.14 penalties and Belgium’s Edouard Simonet rounded out the podium with 174.15 penalties.